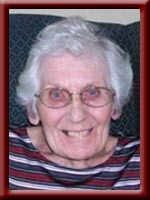 NICKERSON – Ruth Elizabeth “Betty”, 86, of Brooklyn, passed away in North Queens Nursing Home, Caledonia, Saturday, May 15th, 2010. Born in Bridgewater she was a daughter of the late Mervin and Ruth (Wagner) Knox. Betty served in the Air Force. After leaving the Air Force she worked at the General Store in Brooklyn until it closed. She was a devoted member of the Pilgrim United Church, sang in the choir and was a member of the UCW. Betty loved animals, especially her Beagles. Betty is survived by her brother Richard (Sylvia) of Lower Rose Bay, special friends Barry and Wanda Spinney of White Point, brother-in-law Graham Powell and several nieces and nephews. She was predeceased by her husband Aubrey, sisters Kathryn, Joan and Margot, brother Thomas and infant brother Douglas. Our sincerest condolences Richard and Sylvia.We have been neighbours of Betty for thirty years.She was very sweet and pleasant .Betty was just a very quiet and lovely lady.May she rest in peace .The older people on this street are fading away but we shall never forget any of them ,no one could ask for better neighbours. Betty always considered me her daughter. Her birthday fell between my own parent’s. I sang in the Pilgrim United Choir with Betty, and was also a member of the UCW. I will miss this lovely friend and second MOM. My condolences to you all. Condolences to the family of the late Betty Nickerson. Betty was a beautiful woman whom I am grateful for knowing. She always had a smile for everyone. She will be missed by many and I am one of those people. Betty is now with the people she loved most she will always be remembered by me….I loved Betty very much…she was an amazing woman..R.I.P my lovely friend…you will be greatly missed. Our thoughts and prayers are with you.With deepest sympathy.